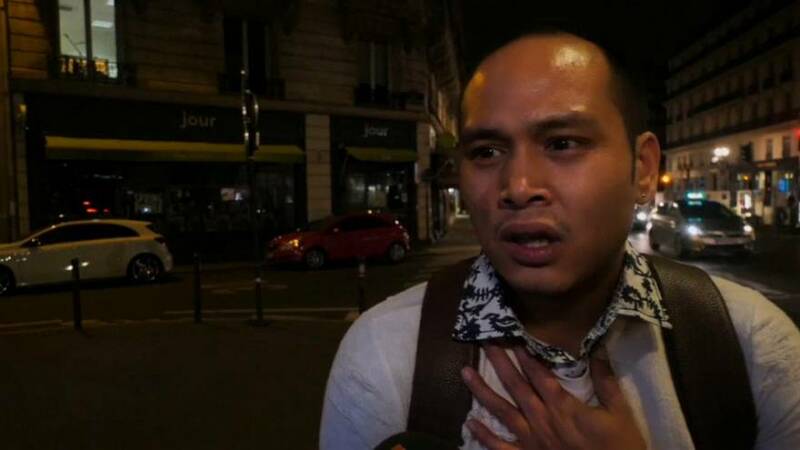 The 29-year-old man, who was killed during the stabbing in Paris on Saturday, has not yet been named. Meanwhile, two of the four who were wounded are in a serious condition but do not have life threatening injuries. Eyewitnesses explained the panic in the hours after the attack. Jonathan, a waiter at a local restaurant, told a reporter, "I was working in the restaurant and suddenly I heard a woman screaming. "She tried to seek shelter in our restaurant but unfortunately she couldn't, he (the knifeman) came and attacked her. "That's when the panic started, everyone started screaming and trying to reach our restaurant. The woman that was attacked was helped by her friend and they managed to walk away. "The attacker just kept walking around with his knife in his bloodied hands and then he approached a shopping area, and then we saw everyone running out of it and the attacker behind them." Milan Charolloys also heard what happened. He said: "We heard some gun shots which came from quite a distance, 100 or 150 metres, but I'm not sure at all. "I walked towards where the shots came from and a policeman ran over asking me if there was a victim and where she was. So we showed him and then we asked him who had been shot, and he said it was the police and that the attacker had been neutralised."